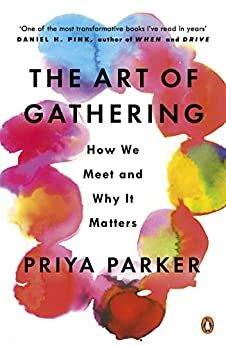 The Art of Gathering shows you how to bring people together to create transformative, breakthrough meetings and experiences. I love this book. It speaks to my heart and soul. And I hope many will read it to experience better meetings, parties, and conferences. Priya Parker has the rare combination of a solid academic background, professional (mediation) experience, and intuition that enables her to analyze gatherings in a way I've never seen before. The lessons she draws from her observations are invaluable and she manages to translate them into clear how-tos for anyone wanting to host or manage friends, family, or their team. Bravo. I host numerous casual events, small dinners, big neighborhood parties and one time a retreat. This book had some great insights on helping people connect in a more personal way that adds something extra special to the event. Priya Parker has put together a book that encompasses these events as well as work events and conference. I was most intrigued about Diner on Blanc. "It's a global dinner-party series hosted all over the world." I can't explain it as well as she does, but a group of friends and strangers, all wearing white, meeting at an unusual location for dinner. I signed up for one in our city. I wanted it on Kindle, but had to buy the book and I'm glad I did. I have so many ideas highlighted that it would have been less useful on the kIndle. I rarely read books during the day (just in the evening before bed), but this book was so interesting I finished in 2 days. You will be touched and encouraged by reading this book. I read this book in one day - I could not put it down. As someone who has spent years gathering people both socially and professionally, and doing a great deal of community building, I could not have asked for better advice. Everything Priya says resonates with the truth. She is spot on and her advice is invaluable. I just bought another book to give to my colleagues. Among friends and colleagues, I am known as a connector. Indeed, without explicitly planning, I helped many friends to find spouses, business partners, mentors or jobs. I have always thought these things happen naturally, without putting a lot of thought or structure. Priya's book proves otherwise. There is always so much you can do improve your gatherings. This book teaches you how to have purposeful meetings. Time is the most valuable asset. Given how much time we spend getting bored without any purpose in ceremonial business or government meetings or extended family gatherings, I wish this book was given as a compulsory textbook to high school students. It would tremendously help improving our life. This book has profoundly changed my perception of why and how we gather - whether it is for a conference, a wedding, a potluck, or work meeting. There is so much emphasis these days on what food to serve or how to make a party place look great - both of which, to me, have never seemed to affect how an event actually unfolds, or how it feels to attend an event. This book takes a different and new approach to these events and makes insightful/helpful suggestions about how to make people feel welcome, how to make a meeting/conference worth everyone's time, how to get people to engage in whatever the event is about. It also explains why, sometimes when you go to an event, you don't feel welcome or it doesn't feel worth our time. This book literally changed the way I see the world and how I approach the many gatherings I do for work and social life.